Knowing when to harvest winter squash such as pumpkins and others can mean the difference between storing them all winter long and watching them go bad. If squash are harvested and stored properly, you can enjoy them for many months to come. The trick is watching the signs and signals to know when to harvest winter squash. Both winter and summer squash need warm temperatures to grow. But unlike summer squash, which are picked when still fairly immature so that their peels are tender and their seeds small, winter squash must ripen on the vine and fully mature. Giving them this extra time on the vine ensures the rind hardens, which makes them easily stored if kept cool. There are many other types of squash considered winter squash, too, including heirloom varieties not found in the average grocery store. Winter squash are easy to grow from seed, and growing heirloom and unusual varieties is just part of the fun. When planting winter squash, read the seed package. Most seed packages state the number of days until maturity. This is the average period of time from planting to harvest. Your squash may need a few days more or less, but knowing what it says on the seed package can give you a rough date to look forward to for the harvest. 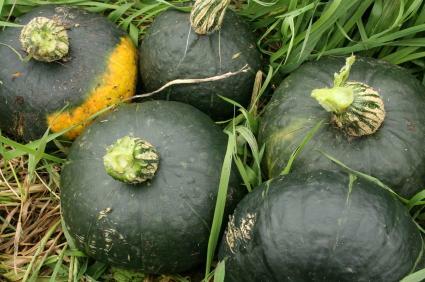 Try to harvest squash on a sunny, dry day after a period of dry weather. The squash will be easier to cut from the vines and ready for either curing or storage. If you pick a squash and it has a noticeable hole, rotten spot or break in the rind, discard it. It should not be stored. Pumpkins: Look for pumpkins that have turned orange all over. The stem where the pumpkin joins the rind should be dry. Sometimes the little tendrils of vines near the stem are dry and curl up. Cut the stem near the top, leaving several inches of stem at the top of the pumpkin itself. The rind should be very hard. If you press your thumbnail into the rind on a pumpkin ready to harvest, you probably can't puncture the rind. An immature pumpkin gives easily under pressure from a fingernail. Acorn, Butternut and Spaghetti Squash: Look for a change in the appearance of the squash. Immature fruits have a shiny, glossy look to the surface. As the fruit matures, they tend to take on a dull sheen. Certain winter squash, such as pumpkins, need about 10 days stored in warm temperatures of around 85 degrees before moving them into long term storage. This process, known as curing, gives the rind time to harden even more, which protects the nutritious flesh inside the pumpkin and prevents it from rotting. Pumpkins cured properly can be stored for many months in a root cellar, basement or other cool conditions. Acorn, butternut and spaghetti squash don't benefit from a curing period. Acorn squash can actually start to go bad if you try to cure them in 85 degree temperatures like a pumpkin. Instead, pick a dry, sunny day to harvest them and put them immediately into storage. Store in a single layer in box in a cool, dark place such as a basement or a root cellar. If you have only a few, you can place them in the refrigerator until you're ready to use them. If you've harvested your winter squash and there's so much you're wondering how you'll ever eat it all, there are options other than hiding it on a neighbor's porch. Many local food pantries and food banks will accept fresh garden produce. Plant a Row for the Hungry and Ample Harvest are two non profit groups that can also connect you with places eager for fresh vegetable donations.